This dish is intended to be served as an entrée and delivers a decadent blend of flavor that is rich and inviting. You could also break up the components to complement and accompany roast poultry or game birds. Any way you choose to serve it, this dish is a serious elevation on comfort food. Trim the mushrooms. Slice large caps into fairly even pieces; leave smaller caps intact. Melt butter in a large skillet over medium heat. Add shallots and garlic and cook until tender, stirring occasionally, about 15 minutes. Add mushroom caps and cook until they release their liquid. Add prepared Knorr® Brown Gravy and cook for about 5 minutes more. Add tomato puree and cook for another 5 minutes. Add thyme. Place the garlic and thyme in a cheese cloth sachet. Combine the milk, cream, prepared Knorr Chicken LCB and garlic sachet in a saucepan and bring to a simmer. Remove from heat and let stand for 30 minutes. Remove sachet. Return liquid to heat and bring to a slow boil. Slowly whisk in polenta. Continue whisking until thick. Place the greens in a bowl, and drizzle with the olive oil, lemon juice and salt and pepper. Use your hands to make sure the greens are completely coated with oil. Spread evenly on a parchment lined baking sheet. Roast in the oven for 5 minutes. Toss and return to oven for 5 minutes more. Taleggio is a semi soft cheese – freeze quickly to more easily slice it. Divide polenta evenly among 8 shallow bowls. 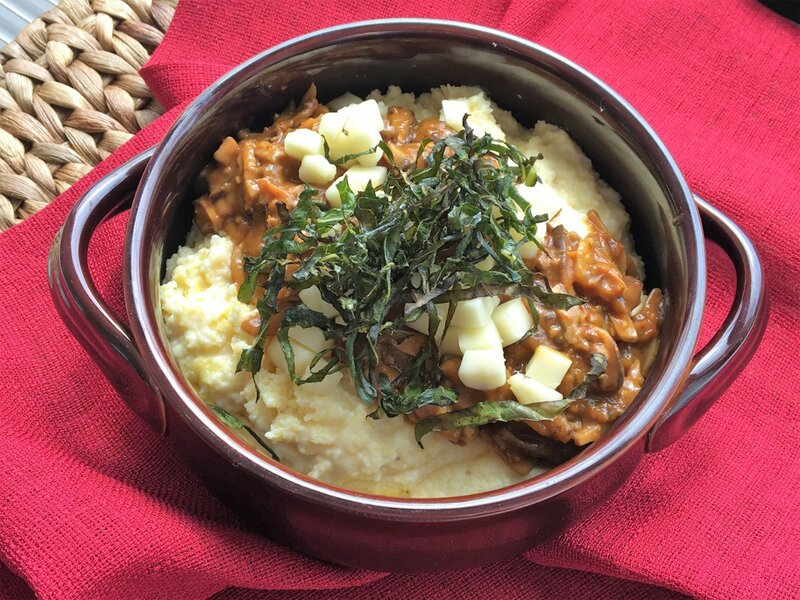 Spoon the mushroom ragout over the polenta. Top with sliced taleggio. Garnish with charred greens.